Thank you for joining me as we count down to the MFT release. We are just one day away from the big day! All the new Stamps, Die-namics, and Stencils will be available on Tuesday, July 11 at 9:00 pm EST. Be sure to check out the MFT Blog to see all the new items being revealed today. Don't forget to leave a comment on the MFT Blog countdown posts, YOU could win one of the five $75.00 gift vouchers. The new Celebrate Die-namics is one of my favourites from this release. I just love the look of the font and I know I am going to get a ton of use out of it. For this card I paired it with the fabulous Heart-Shaped Balloon Die-namics. To create the rainbow effect, I sponged the various colours of Premium Dye ink on Smooth White card stock. I added adhesive sheets to the back of the card stock before I die-cut it. To keep the word celebrate straight, I used the negative as a gudie when adhering the letters. 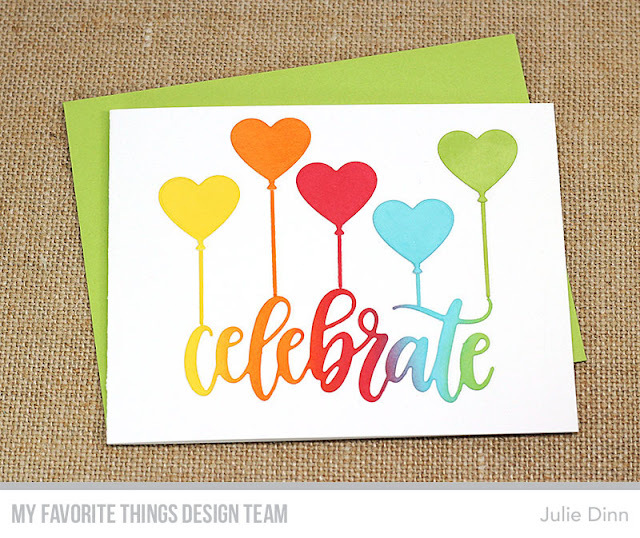 Julie, coordinating the word and balloon colors creates a delightful card. Thanks for sharing this. Really cute. Love how you tied in the balloons! I love the rainbow sentiment!Beautiful little card!Thanks for sharing! Super cute card! I really love this new release! A-h-h, simple sweet colorful...love it! Wow this is a perfect color match. Beautiful flow of rainbow colors. 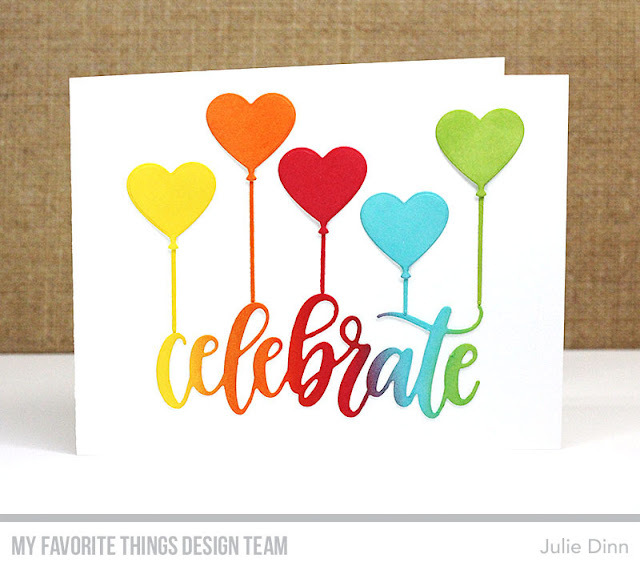 The sentiment, balloons, and rainbow colors are so great together! Love this!